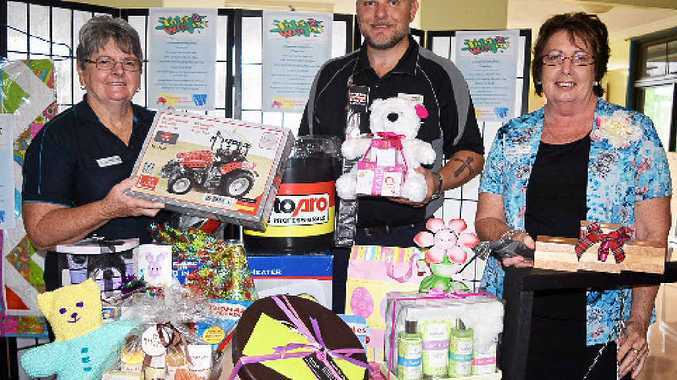 YOU'VE got to be in it to win it - at least at the Proserpine Nursing Home this week, where a special fundraiser is being held to buy equipment for the residents. Nursing Home Lifestyle Co-ordinator, Nancy Bellert, said the money would go towards new beds or lifters "to make it easier for the resident's comfort and care". A family tour pass on the Prime Time Adventure Aqua Bus and a cruise with Whitsunday Cruises are just two of the amazing prizes on offer this Sunday, from 1-4pm. "There is also a hand-made quilt by one of the nursing homes quilters and Advanced Windscreens in Proserpine has given us a $50 voucher," Ms Bellert said. Music on the day will be courtesy of the nursing home choir, Simply Sensational, and local identity Jenni Borellini. "Jenni donates her time to the nursing home quite a lot and is great supporter of ours," Ms Bellert said. Entry is $2 per person or $ 5 for three people, which includes afternoon tea. Tickets for the lucky door prize and the raffles can be purchased from 1pm.